After almost a decade, Hyperion is delighted to welcome back the world-famous St Paul’s Cathedral Choir under its new director of music, Hyperion artist and also director of The Cardinall’s Musick, Andrew Carwood. Joined by the St Paul’s Mozart Orchestra and a quartet of renowned soloists, Carwood leads sparkling performances of a selection of Mozart’s sacred music. Although they were commissioned to be sung at church services in Salzburg, all these compositions are suffused with Mozart’s typically unerring sense of dramatic pacing and a sensuous, operatic treatment of solo lines, as well as crisp and energetic choral writing. Having learned to play straightforward pieces on the piano by the age of four, it is thought that Wolfgang Amadeus Mozart (1756–1791) gave his first public performance in his home town of Salzburg in September 1761. In 1762 he played for Maximilian III, the Elector of Bavaria, and from then on his early life was a whirlwind of tours and concerts, with visits to nearly all of the major centres of music-making in mid-eighteenth-century Europe: between June 1763 and the end of 1767 Mozart visited Germany, France, the Low Countries, England and Switzerland. He was mentored by, or perhaps some in the modern age would say exploited by, his father Leopold who also saw to his general education. Leopold Mozart (1719–1787) spent most of his life as a musician at the Court of the Prince-Archbishops of Salzburg. By the time that Leopold and his family began their travels they were supported by Archbishop Siegmund Christoph von Schrattenbach (1698–1771) who not only allowed Leopold time away from his position as Vice-Kapellmeister but also provided some financial support for these foreign tours. Schrattenbach was an ultra-conservative and a patron of the arts and, relatively speaking, a ‘popular’ Archbishop. The same could not be said of his successor Hieronymus Colloredo (1732–1812) who, after a controversial election, became Prince-Archbishop on 14 March 1772. Colloredo has suffered a bad press over the years and it is certainly true that he was less immediately appealing as a person than Schrattenbach. Serious-minded, misanthropic and never outwardly fond of his fellow human beings, he nonetheless was a strong supporter of the new ideas of the Enlightenment, and successfully reformed the Salzburg court now in financial ruin after Schrattenbach’s massive over-spending. Both Leopold and Wolfgang made clear in their letters that they had little respect for Colloredo, who was difficult over their requests for absence, had a policy of requiring musical compositions to be shorter, and began advancing Italian musicians above native Austrians. Colloredo never achieved any measure of popularity and was forced to leave Salzburg in 1800 with Napoleon poised to attack the city. He resigned in 1803 and control of the city was passed to the Grand Duke of Tuscany. In so doing he became the last of the Prince-Archbishops: Salzburg would never again be ruled by a cleric. Our church music is very different from that of Italy, since a Mass with the whole Kyrie, the Gloria, the Credo, the Epistle Sonata, the Offertory or Motet, the Sanctus and the Agnus Dei must not last longer than three quarters of an hour. This applies even to the most Solemn Mass said by the Archbishop himself. It is certainly true that, after Colloredo’s elevation, Mozart uses a more efficient, syllabic style, but his music is still suffused with brilliance and fine touches of drama. He produced over fifty sacred compositions whilst in Salzburg, using a variety of styles and clearly experimenting with ideas which were to reach their fulfilment in later works. The gorgeous ‘Agnus Dei’ solo from the Missa solemnis in C prefigures the Countess’s aria ‘Porgi amor’ from Le nozze di Figaro whilst the keyboard obbligato writing of the Epistle Sonata in C clearly points the way to the piano concerti. The Missa in C major (‘Missa solemnis et brevis’, K337) is the last Mass-setting written for Salzburg, and indeed the last Mass which the composer completed. It bears the date March 1780 as does the Epistle Sonata (K336) which, almost certainly, is a companion piece. Masses in Salzburg are usually described either as ‘longa’ (‘long’) or ‘brevis’ (‘short’) but this setting is yet another form. It is ‘brevis’ in that it is quite efficient, but Mozart also uses the title ‘solemnis’ (‘solemn’) indicating its suitability for a grand occasion and highlighting the augmented instrumentation. The Mass is scored for strings (without violas) and has three trombone parts doubling the alto, tenor and bass parts of the chorus, but it is further enhanced by trumpets, timpani, oboes and bassoons. The first three movements of K337 are in a style of which the Archbishop would most certainly have approved. The ‘Kyrie’ has a rather subdued opening but one which is solemn and penitential (not always the case in settings from this period). The ‘Gloria’ stands in contrast with its bustling instrumental writing and energetic choral parts and moves through the text at some speed. Only in the final ‘Amen’ does Mozart allow himself a little liberty with two coloratura sections for the soprano soloist. The ‘Credo’ continues the energetic mood and uses a rondo-like form with Mozart repeating an infectious swinging motif throughout the movement. After the ‘Credo’ things begin to change as Mozart starts to assert his own musical priorities as well as perhaps making a pointed gesture at Colloredo. The Archbishop had no time for fugues in music which could be lengthy and involved repetition of the text: he also disliked extended solos such as those sung by great divas in the opera houses. The ‘Sanctus’ begins in a solemn style but leads to a rather cheeky ‘Osanna’. For the ‘Benedictus’ there is a real change of direction as Mozart uses a serious-sounding fugue in A minor and unusually makes no use of the soloists before the return of the ‘Osanna’. Even more mischievously, he writes a gorgeous aria in the contrasting key of E flat major for the ‘Agnus Dei’, one that belongs more to the world of opera than to that of church music, and which also features an obbligato organ part and exquisite oboe and bassoon writing. The Epistle Sonatas, or organ sonatas, had a very particular function in Salzburg Cathedral, namely to cover the period of movement during Mass after the reading of the Epistle and before the reading of the Gospel: hence the inclusion here of the Sonata in C (K336) between the ‘Gloria’ and ‘Credo’ of the Missa solemnis. Mozart produced seventeen such sonatas, the majority of which are scored for just strings and organ and all of which use sonata form with first and second subjects, a truncated development section and recapitulation. In this last sonata written before his removal to Vienna, Mozart has provided a glorious obbligato part for the organ including the opportunity for a final cadenza. Mozart produced three settings of the Regina caeli, the text in honour of the Virgin Mary designed to be said or sung throughout the season of Easter. It is thought that the Regina caeli in C (K108) was written in May 1771 for Maria Magdalena Lipp (the wife of Michael Haydn). The four-movement setting is certainly festal and sets two extended arias for soprano (Colloredo did not become Archbishop until 1772!) framed by two energetic outer movements for orchestra and choir. The second movement is a graceful slow dance made even more lilting by the addition of flutes and the gentle interjections of the chorus. 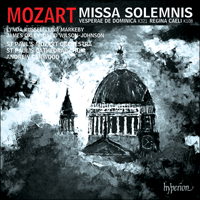 The exquisite gem of this setting is the third movement ‘Ora pro nobis’ which clearly shows the influence of the sort of sacred music that Mozart would have encountered in Naples, whilst the final movement contains an early prefiguring of Figaro and Susanna’s duet ‘Se a caso madama’. Alongside the regular celebration of the Eucharist, the other service which required large-scale musical input was the Office of Vespers, consisting of five Psalms and the ‘Magnificat’. Mozart wrote two complete settings for Vespers (although he never set the opening Response nor the Antiphons which are used to frame the Psalms and Canticle). The Vesperae solennes de Dominica (K321) or ‘Sunday Vespers’ could be used on many of the Sundays throughout the year, unless a particular feast day or season required the use of a different set of texts. Scored for four soloists and chorus, Mozart once again uses trombones to double the lower chorus parts. The strings (without violas) play throughout but trumpets and timpani are added to the first Psalm and the ‘Magnificat’ for extra solemnity. ‘Dixit Dominus’ is grand and imposing, complete with dogmatic statements from both choir and instruments, whilst the second Psalm, ‘Confitebor tibi’, is a serious-sounding movement in E minor with the chorus replying to the soprano soloist. The next three Psalms display radically different styles. ‘Beatus vir’ is more brilliant and more operatic in its writing whilst the fourth Psalm ‘Laudate pueri’ is the complete opposite; a ‘stile antico’ canon, with an alla breve swing and without the use of soloists. Also in juxtaposition is the graceful and operatic ‘Laudate Dominum’ for soprano solo and organ obbligato, the perfect change of style before the dramatic coup of the ‘Magnificat’ which begins with a slow, solemn introduction before launching into a vigorous allegro. It is almost as if Mozart is demonstrating the whole range of his musical genius here with radically different styles for each movement. All of these composed elements of Vespers would originally have been separated by Antiphons, sung to plainchant, and it is clear from the choice of keys—C major, E minor, B flat major, F major, A major and C major respectively—that the Antiphons would provide a musical link between the Psalms. However Mozart once again shows his dramatic genius and his clear sense of narrative. These individual Psalm movements are so ordered that there is a real dramatic progression, a musical journey which goes through a variety of regions before culminating in an almost symphonic setting of the ‘Magnificat’. It was this deep understanding of drama, this ability to lead with a clear sense of the effect that his music would have on the listener which allowed Mozart to write great opera and this, his great gift, is clearly seen first in his music for the church. Ayant appris à exécuter des pièces simples à l’âge de quatre ans, Wolfgang Amadeus Mozart (1756–1791) se serait produit pour la première fois en public dans sa ville natale de Salzbourg, en septembre 1761. Du jour de 1762 où il joua pour l’électeur de Bavière Maximilien III, sa jeune existence fut un tourbillon de tournées et de concerts, dans presque tous les grands centres musicaux de l’Europe du milieu du XVIIIe siècle: de juin 1763 à la fin de 1767, il visita l’Allemagne, la France, les Pays-Bas, l’Angleterre et la Suisse, guidé—d’aucuns diraient, aujourd’hui, exploité—par son père Leopold, qui veilla également à son éducation générale. Leopold Mozart (1719–1787) fut presque toute sa vie musicien à la cour des princes-archevêques de Salzbourg. Lorsqu’il commença à voyager en famille, ce fut avec l’appui de Siegmund Christoph von Schrattenbach (1698– 1771), qui le laissa se libérer de ses fonctions de vice-Kapellmeister, tout en soutenant financièrement ses tournées à l’étranger. Ultra-conservateur, mécène des arts, Schrattenbach fut, relativement parlant, un archevêque «populaire», contrairement à son successeur Hieronymus Colloredo (1732–1812), devenu prince-archevêque le 14 mars 1772, après une élection controversée. Au fil des ans, Colloredo eut de plus en plus mauvaise presse et il était, c’est certainement vrai, moins immédiatement engageant que quelqu’un comme Schrattenbach. Sérieux, misanthrope, ne donnant jamais l’impression de raffoler de ses semblables, il n’en soutint pas moins ardemment les nouvelles idées des Lumières et il réforma avec succès la cour de Salzbourg, ruinée par les folles dépenses de Schrattenbach. Dans leurs lettres, Leopold et Wolfgang ne cachèrent pas le peu de respect qu’ils avaient pour ce Colloredo qui rechignait à leur accorder du congé, demandait des œuvres musicales plus courtes et commençait à mettre en avant les musiciens italiens, au détriment des autrichiens. Colloredo, qui n’obtint jamais une once de popularité, fut contraint de quitter Salzbourg en 1800, alors que Napoléon était sur le point d’attaquer la ville. Lorsqu’il démissionna en 1803, celle-ci passa sous le contrôle du grand duc de Toscane et il devint, de fait, le dernier des princes-archevêques: jamais plus Salzbourg ne devait être gouverné par un ecclésiastique. Notre musique d’église est bien différente de celle d’Italie, car une messe avec tout—le Kyrie, le Gloria, le Credo, la sonate d’épître, l’offertoire ou un motet, le Sanctus et l’Agnus Dei—ne doit pas dépasser trois quarts d’heure. Cela vaut même pour la messe la plus solennelle, dite par l’archevêque en personne. Après l’élévation de Colloredo, Mozart développa assurément un style plus efficace, syllabique, mais encore baigné de brio et de jolies touches dramatiques. À Salzbourg, il produisit plus de cinquante œuvres sacrées, dans des styles variés, où il expérimenta, à l’évidence, des idées appelées à s’épanouir. Le somptueux «Agnus Dei» solo de la Missa solemnis en ut préfigure ainsi l’aria de la Comtesse «Porgi amor» dans Le nozze di Figaro, cependant que l’écriture obbligato du clavier dans la Sonate d’épître en ut pave clairement la voie aux concerti pour piano. La Missa en ut («Missa solemnis et brevis», K337) est la dernière messe que Mozart écrivit pour Salzbourg—la dernière, aussi, qu’il acheva. Elle porte la date de mars 1780, tout comme la Sonate d’épître (K336) qui va très certainement avec. Les messes salzbourgeoises sont généralement dites «longa» («longue») ou «brevis» («brève»), mais celle-ci affecte une autre forme: elle est «brevis» par son extrême efficacité mais Mozart la dit aussi «solemnis» («solennelle») pour indiquer qu’elle convient à une grande occasion et souligner son instrumentation augmentée. Écrite pour cordes (sans altos), elle a trois parties de trombones doublant les parties d’alto, de ténor et de basse du chœur, des trompettes, des timbales, des hautbois et des bassons venant ensuite en renfort. Les trois premiers mouvements de K337 ont un style que l’archevêque dut très certainement approuver. Le «Kyrie» a une ouverture assez sobre, mais solennelle et pénitentielle (ce qui n’est pas toujours le cas dans les messes de l’époque). Le «Gloria», qui se démarque par une écriture instrumentale animée et des parties chorales énergiques, déroule le texte à une certaine allure et c’est seulement dans l’«Amen» final que Mozart s’octroie un peu de liberté avec deux sections coloratura pour la soliste soprano. Le «Credo» prolonge cette vigueur et utilise une forme façon rondo qui voit Mozart constamment répéter un contagieux motif cadencé. Après le Credo, les choses commencent à changer car Mozart se met à affirmer ses propres priorités musicales, tout en faisant peut-être un geste appuyé en direction de Colloredo. Ce dernier n’avait pas de temps pour les fugues, qui pouvaient traîner en longueur et impliquaient de répéter le texte; il ne goûtait pas non plus les imposants solos comme ceux des grandes divas, dans les opéras. Le «Sanctus» s’ouvre dans un style solennel mais débouche sur un «Osanna» plutôt impertinent. Le «Benedictus» est l’occasion d’un véritable changement de cap: Mozart recourt à une fugue d’allure sérieuse, en la mineur, et, pour une fois, ne fait intervenir aucun soliste. Plus malicieusement encore, il écrit une somptueuse aria dans le contrastif ton de mi bémol majeur pour l’«Agnus Dei», qui ressortit plus à l’opéra qu’à la musique liturgique avec, aussi, une partie d’orgue obbligato et une exquise écriture de hautbois et de basson. Les sonates d’épître, des sonates pour orgue, avaient un rôle bien particulier à la cathédrale de Salzbourg: elles devaient combler le moment de la messe entre la fin de la lecture de l’épître et le début de celle de l’évangile. D’où l’insertion ici de la Sonate en ut (K336), entre le «Gloria» et le «Credo» de la Missa solemnis. Mozart produisit dix-sept de ces pièces; très souvent écrites juste pour cordes et orgue, elles affectent toutes la forme sonate, avec un premier et un second sujet, un développement tronqué et une réexposition. Dans K336—la dernière sonate rédigée avant son départ pour Vienne—, Mozart offre à l’orgue une glorieuse partie obligée, avec une possibilité de cadenza finale. Par trois fois, Mozart mit en musique le Regina caeli, texte en l’honneur de la Vierge Marie qui doit être dit ou chanté pendant la saison pascale. On pense que le Regina caeli en ut (K108) fut écrit en mai 1771 pour Maria Magdalena Lipp (la femme de Michael Haydn). Cette œuvre en quatre mouvements, sûrement destinée à une fête religieuse, propose deux arias prolongées pour soprano (Colloredo ne devint archevêque qu’en 1772! ), cernées par deux énergiques mouvements extrêmes pour orchestre et chœur. Le deuxième mouvement est une gracieuse danse lente rendue encore plus harmonieuse par l’ajout de flûtes et par les douces interventions du chœur. Le petit bijou de cette œuvre est le troisième mouvement, un «Ora pro nobis» nettement influencé par le type de musique sacrée que Mozart avait rencontrée à Naples; quant au dernier mouvement, il recèle une préfiguration primitive du duo de Figaro et Susanna «Se a caso madama». La célébration régulière de l’eucharistie n’était pas le seul office à requérir une musique d’envergure: il y avait aussi les vêpres, constituées de cinq psaumes et du «Magnificat». Mozart en fit deux mises en musique complètes (moins, toutefois, le répons inaugural et les antiennes encadrant les psaumes et le cantique). Ses Vesperae solennes de Dominica K321, ou «vêpres dominicales», pouvaient servir lors de nombreux dimanches de l’année, sauf si une fête ou une saison particulière exigeait une autre série de textes. Écrites pour quatre solistes et chœur, elles recourent, elles aussi, à des trombones pour doubler les parties chorales inférieures. Les cordes (sans altos) jouent de bout en bout mais, pour plus de solennité, le premier psaume et le «Magnificat» se voient adjoindre des trompettes et des timbales. Le «Dixit Dominus» est grandiose et imposant, avec des énonciations dogmatiques et chorales et instrumentales, cependant que le deuxième psaume, «Confitebor tibi», est un mouvement sérieux en mi mineur, où le chœur répond au soprano solo. Les trois psaumes suivants arborent des styles radicalement différents. Le «Beatus vir» a une écriture plus brillante, opératique, qui le place aux antipodes du quatrième psaume, «Laudate pueri»—un canon en «stile antico», avec un rythme alla breve, sans solistes. L’avenant et opératique «Laudate Dominum» pour soprano et orgue obligé offre également un changement de style parfait avant le coup de théâtre du «Magnificat», qui s’ouvre sur une lente et solennelle introduction pour ensuite se lancer dans un vigoureux allegro. C’est presque comme si Mozart déployait devant nous toute la palette de son génie musical avec, à chaque mouvement, un style radicalement différent. À l’origine, toutes ces composantes des vêpres étaient séparées par des antiennes exécutées en plain-chant et qui, au vu des tonalités retenues—respectivement ut majeur, mi mineur, si bémol majeur, fa majeur, la majeur et ut majeur—, faisaient le lien musical entre les psaumes. Mozart n’en montre pas moins tout son génie dramatique et son sens manifeste de la narration. Les mouvements des psaumes sont ici si bien agencés qu’il existe une réelle progression dramatique, un voyage musical qui emprunte diverses régions avant de culminer en un «Magnificat» quasi symphonique. Cette profonde intelligence du drame, cette aptitude à avancer en se figurant bien l’effet que sa musique produirait sur l’auditeur permirent à Mozart d’écrire de grandes œuvres. Et ce don immense qui fut le sien naquit clairement dans sa musique liturgique. Wolfgang Amadeus Mozart (1756–1791) spielte bekanntermaßen schon im Alter von vier Jahren einfache Stücke am Klavier und gab seine erste öffentliche Aufführung wohl im September 1761 in seiner Heimatstadt Salzburg. 1762 spielte er Maximilian III. Joseph von Bayern vor, woraufhin ein wahrhaftiger Wirbelwind an Konzerten und Tourneen folgte und er fast alle großen Musikzentren Europas der Mitte des 18. Jahrhunderts besuchte: zwischen Juni 1763 und dem Ende des Jahres 1767 reiste Mozart nach Deutschland, Frankreich, England, in die Niederlande und die Schweiz. Dabei wurde er von seinem Vater betreut—heutzutage würden auch manche sagen: ausgebeutet—der sich auch um seine Allgemeinbildung kümmerte. Leopold Mozart (1719–1787) verbrachte den Großteil seines Lebens als Musiker am Hof der Fürsterzbischöfe in Salzburg. Als Leopold sich mit seiner Familie auf die Reisen begab, wurden die Mozarts von Sigismund III. Christoph von Schrattenbach (1698–1771) unterstützt, der Leopold nicht nur von seinen Aufgaben als Vizekapellmeister vorübergehend befreite, sondern diese Auslandsreisen auch finanziell förderte. Schrattenbach war ultrakonservativ, ein Förderer der Künste und als Erzbischof relativ beliebt. Dasselbe kann über seinen Nachfolger Hieronymus Colloredo (1732–1812) nicht gesagt werden, der nach einer umstrittenen Wahl am 14. März 1772 zum Fürsterzbischof ernannt wurde. Colloredo hat über die Jahre eine schlechte Presse bekommen und war als Person sicherlich nicht so direkt ansprechend wie Schrattenbach. Er war ernsthaft und misanthropisch veranlagt, trotzdem aber ein starker Förderer des neuen Ideenguts der Aufklärung und es gelang ihm, nachdem Schrattenbach mit den Finanzen äußerst verschwenderisch umgegangen war, den Salzburger Hof mit Erfolg zu reformieren. Sowohl Leopold als auch Wolfgang ließen es in ihren Briefen deutlich werden, dass sie für Colloredo keinen Respekt hegten, der ihren Beurlaubungsanträgen wenig Entgegenkommen zeigte, grundsätzlich kürzere musikalische Kompositionen verlangte und begann, italienische Musiker den Österreichern gegenüber vorzuziehen. Colloredo gelang es nicht, sich bei seinen Untertanen beliebt zu machen und im Jahre 1800 musste er Salzburg notgedrungen verlassen, als Napoleon im Begriff war, die Stadt anzugreifen. 1803 dankte er ab und die Herrschaft über die Stadt wurde dem Großfürsten der Toskana übertragen, so dass Colloredo der letzte Fürsterzbischof war: Salzburg sollte nie wieder von einem Geistlichen regiert werden. Unsere Kirchenmusik unterscheidet sich sehr von der in Italien, um so mehr, da eine Messe mit Allem—dem Kyrie, Gloria, Credo, Epistelsonate, dem Offertorium oder auch einer Motette, Sanctus und Agnus Dei—ja selbst die allersolenneste, wenn der Fürst die Messe selbst hält, nicht länger als drei Viertelstunden dauern darf. Es bedarf eines besonderen Studiums für diese Art der Komposition, und zwar deshalb, weil es eine Messe mit vollem Instrumentarium—Kriegstrompeten und Pauken—sein muss. Es stimmt durchaus, dass Mozart nach der Ernennung Colloredos sich eines effizienteren, syllabischen Stils bedient, doch ist seine Musik nach wie vor von Brillanz erfüllt und weist einen gelungenen Anflug von Dramatik auf. Er komponierte während seiner Salzburger Zeit über fünfzig geistliche Werke, in denen verschiedene Stile zum Ausdruck kommen—er experimentierte offenbar mit Ideen, die in späteren Werken dann in ausgereifter Form erschienen. So ist das wunderschöne „Agnus Dei“ für Solostimme aus der Missa solemnis in C ein Vorläufer der Arie „Porgi amor“ der Gräfin in Le nozze di Figaro, während die obligate Stimme für Tasteninstrument der Epistelsonate in C ganz offensichtlich die Klavierkonzerte antizipiert. Die Missa in C („Missa solemnis et brevis“, KV 337) ist die letzte Messvertonung, die für Salzburg entstand und die letzte Messe, die der Komponist vollendete. Sie ist auf März 1780 datiert—so auch die Epistelsonate KV 336, die sicherlich ein Begleitstück ist. Salzburger Messen werden meistens entweder als „longa“ („lang“) oder „brevis“ („kurz“) bezeichnet, doch handelt es sich hierbei um eine noch andere Form. Sie ist „brevis“, also recht effizient angelegt, doch verwendet Mozart zusätzlich den Titel „solemnis“ („feierlich“) und verweist damit auf die erweiterte Instrumentierung und Tauglichkeit für einen größeren Anlass. Die Messe ist für Streicher (ohne Bratschen) angelegt und hat drei Posaunenstimmen, die die Alt-, Tenor- und Bassstimmen des Chors verdoppeln, und ist zusätzlich mit Trompeten, Pauken, Oboen und Fagotten besetzt. Die ersten drei Sätze dieser Messe stehen in einem Stil, der sicherlich die Zustimmung des Erzbischofs fand. Das „Kyrie“ beginnt recht gedämpft, ist jedoch feierlich und reuevoll gehalten (was in Messvertonungen dieser Zeit nicht immer der Fall ist). Im Kontrast dazu steht das „Gloria“ mit seinem geschäftigen Instrumentalsatz und den energischen Chorstimmen, die sich recht schnell durch den Text bewegen. Erst im abschließenden „Amen“ erlaubt Mozart sich etwas Freiheit mit zwei Koloratur-Passagen für den Solosopran. Das „Credo“ fährt in der energischen Stimmung fort und verwendet eine rondoartige Form, wobei Mozart den ganzen Satz hindurch ein mitreißendes schwungvolles Motiv einsetzt. Nach dem „Credo“ ändert sich die Lage wieder, wenn Mozart seine eigenen musikalischen Prioritäten durchsetzt und möglicherweise auch eine ostentative Geste Colloredo gegenüber macht. Der Erzbischof konnte Fugen in Musik nicht leiden, die lang geraten konnten und in denen es Textwiederholungen gab. Auch mochte er längere Soli nicht, wie sie zum Beispiel von den großen Diven in den Opernhäusern gesungen wurden. Das „Sanctus“ beginnt in feierlichem Stil, leitet dann jedoch in ein recht kesses „Osanna“ hinüber. Im „Benedictus“ findet ein beträchtlicher Richtungswechsel statt: Mozart komponiert eine ernst klingende Fuge in a-Moll und setzt ungewöhnlicherweise die Solisten darin nicht ein. Noch spitzbübischer ist die wunderschöne Arie in der gegensätzlichen Tonart Es-Dur des „Agnus Dei“, die eher in die Welt der Oper als die der Kirchenmusik gehört und zudem eine obligate Orgelstimme sowie einen exquisiten Oboen- und Fagottsatz hat. Die Epistelsonaten, oder Orgelsonaten, hatten im Salzburger Dom eine spezifische Funktion, nämlich während der Messe den Zeitraum zwischen der Epistellesung und der Evangeliumslesung abzudecken—daher ist hier die Sonate in C (KV 336) zwischen dem „Gloria“ und „Credo“ der Missa solemnis eingefügt. Mozart komponierte 17 solche Sonaten, die zum größten Teil nur für Streicher und Orgel gesetzt sind und die alle in Sonatenhauptsatzform mit ersten und zweiten Themen, verkürzter Durchführung und Reprise angelegt sind. In der letzten Sonate, die er vor seinem Umzug nach Wien schrieb, fügte Mozart eine wunderschöne obligate Stimme für Orgel samt einer Gelegenheit für eine Schlusskadenz ein. Mozart fertigte drei Vertonungen des Regina caeli an, dem zu Ehren der Jungfrau Maria verfassten Text, der in der Osterzeit zu lesen oder zu singen ist. Es wird davon ausgegangen, dass das Regina caeli in C (KV 108) im Mai 1771 für Maria Magdalena Lipp (die Ehefrau von Michael Haydn) entstand. Die viersätzige Anlage ist jedenfalls festlich und stellt zwei längere Sopranarien (Colloredo wurde erst im Jahre 1772 Erzbischof!) zwei energischen Außensätzen für Orchester und Chor gegenüber. Der zweite Satz ist ein anmutiger langsamer Tanz, der durch die hinzugefügten Flöten und die sanften Einwürfe des Chors noch schwungvoller wird. Das exquisite Glanzstück dieser Vertonung ist der dritte Satz, „Ora pro nobis“, bei dem der Einfluss der geistlichen Musik deutlich wird, die Mozart wohl in Neapel zu hören bekommen hatte. Der letzte Satz hingegen ist ein Vorläufer des Duetts „Se a caso madama“ zwischen Figaro und Susanna. Neben der regulären Eucharistiefeier wurden auch für den Vespergottesdienst größere Vertonungen benötigt, nämlich fünf Psalmen und das „Magnificat“. Mozart komponierte entsprechende Werke für zwei vollständige Vespergottesdienste (doch vertonte er weder Eröffnungsresponsorien noch Antiphone, die dazu verwendet werden, die Psalmen und das Canticum einzurahmen). Die Vesperae solennes de Dominica (KV 321), oder „Sonntagsvespern“, konnten für die meisten Sonntage während des Kirchenjahrs eingesetzt werden, es sei denn es mussten aufgrund einer besonderen Jahreszeit oder wegen eines spezifischen Festtags andere Texte verwendet werden. Dieses Werk ist mit vier Solisten und Chor besetzt und Mozart verwendet wiederum Posaunen, um die tieferen Chorstimmen zu verdoppeln. Die Streicher (ohne Bratschen) spielen durchgehend, doch werden dem ersten Psalm und dem „Magnificat“ Trompeten und Pauken hinzugefügt, um für besondere Feierlichkeit zu sorgen. Das „Dixit Dominus“ ist großartig und imposant und sowohl Chor als auch Orchester treten sehr kräftig auf, während der zweite Psalm, „Confitebor tibi“, ein ernst klingender Satz in e-Moll ist, in dem der Chor dem Solosopran antwortet. Die folgenden drei Psalmen sind stilistisch völlig anders geartet. „Beatus vir“ ist eher brillant und opernhaft angelegt, während der vierte Psalm, „Laudate pueri“, dazu einen krassen Gegensatz bildet: es handelt sich dabei um einen Kanon im „stile antico“ in einem schwungvollen Alla-breve-Takt, in dem die Solisten nicht zum Einsatz kommen. Ebenfalls gegensätzlich angelegt ist das anmutige und opernhafte „Laudate Dominum“ für Solosopran und obligate Orgel—der perfekte Stilwechsel vor dem dramatischen Coup des „Magnificat“, das mit einer langsamen, feierlichen Einleitung beginnt, bevor es in ein lebhaftes Allegro übergeht. Es hat fast den Anschein, als wollte Mozart mit diesen grundverschiedenen Stilen seine umfassende geniale musikalische Palette demonstrieren. Alle diese komponierten Elemente des Vespergottesdienstes wurden ursprünglich durch Antiphone getrennt, die im Cantus planus gesungen wurden. Der Tonartenfolge—C-Dur, e-Moll, B-Dur, F-Dur, A-Dur und C-Dur—kann man entnehmen, dass die Antiphone die Psalmen musikalisch miteinander verknüpften. Ebenfalls jedoch zeigt sich hier sehr deutlich Mozarts dramatisches Genie und sein ausgeprägter Sinn für Schilderungen. Diese Psalmsätze sind so angeordnet, dass sich eine echte dramatische Entwicklung ergibt, eine musikalische Reise, die mehrere Regionen durchschreitet, bevor sie in einer fast symphonischen Vertonung des „Magnificats“ ihren Höhepunkt erreicht. Dank eben diesem tiefen dramatischen Verständnis, dieser Fähigkeit, genau zu wissen, wie der musikalische Aufbau auf die Hörer wirken würde, gelang es Mozart, große Opern zu komponieren, und diese enorme Gabe zeichnet sich erstmals deutlich in seiner Musik für die Kirche ab.